The kitchen top perhaps occupies most of the exposed area of your kitchen. The moment you look at the kitchen, you might not think much of the cabinets or the sanitary are of the kitchen or its appliances; what will catch your eye would quite evidently be the ambience of the kitchen that would be determined by your kitchen top. 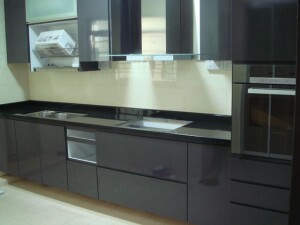 Just like the colour scheme and ambience of your home matter so much to you, so should the kitchen top. Much more than anything else, the top should complement the overall setting of the kitchen. Solid Surface: These are generally made of acrylic and plastic. The higher the acrylic content, the better it is. Since it is made artificially, a lot of characteristics can be built into the top. However this kind of top is quite prone to physical wear and tear and colour damage. Usually from Korea, Usa, Singapore, India, China etc. Quartz: This is also known as engineered stone. To be precise this is the perfect blend of a natural and an artificial kitchen top material. Since it is an optimum blend of the above two, it imbibes pros and cons of the two. Marble: This is another popular kitchen top material. Labelled as ultra traditional, there is no other material that can come even close enough to the exquisiteness of marble as a decorative stone. There can be no other possible stone that can beat the elegance and charm of marble. It can withstand heat and extreme conditions. Getting the right kitchen top is no rocket science. All you need to do is match the pros and cons of each of these materials as against your needs. Apart from the material essentially, you need to match their texture with the ambience of your home and kitchen.